Professional training will give you and your workforce the knowledge of how to tackle a fire, and with which extinguisher, what to do in a fire situation, all of which is valuable and could potentially save your business from major destruction. So don't hesitate to contact us if you need Fire Extinguisher Training Surrey. Call us on 01444 487821 or 07501 724865 to speak to an advisor. Our Fire extinguisher training Surrey areas is a lively course which imparts a lot of useful information to anyone in any situation. It can be tailored for any situation such as in the home or workplace, care home, factory, in shops or offices. We are happy to visit several times to ensure that all your staff are covered as we are aware that some workplaces operate a shift system. The course includes ‘hands on’ practice for everyone to get used to holding a fire extinguisher safely, and will give your staff the confidence to tackle, plus a risk assessment for your building and advice about any additional fire safety precautions that you need to take. If the location permits, i.e. there is a safe space outside, a controlled fire which has been created and will be controlled by the Trainer who will demonstrate how to extinguish it properly with the appropriate fire extinguisher, but if there is not a safe space the demonstration can still be carried out, but without starting a fire or discharging the extinguisher. Practical, hands on demos are of great value within the workplace and will be of great benefit to staff. Professional training will give you the confidence to tackle a fire, and could potentially save your business. ETC Fire Extinguisher Training Surrey - our advisors are here to help with all your fire safety questions. 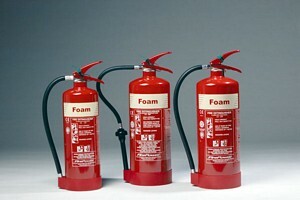 Please note that every five years or sometimes two years, certain fire extinguishers need to be discharged and refilled. Your fire extinguisher service engineer will be able to identify if this is so.